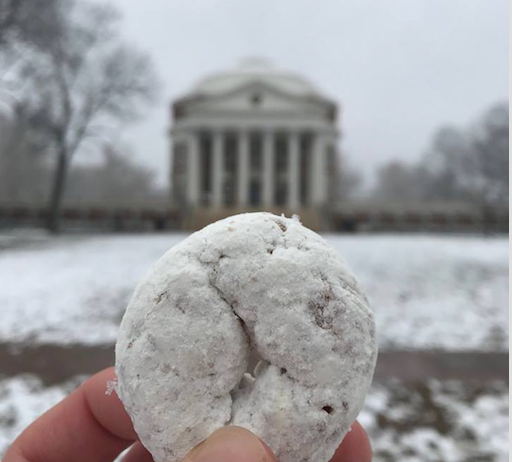 “As we approach the eighth #PowderedDonutDay, this coming Sunday, Father’s Day, I am beginning to realize that Maureen wants me to architect a new skyline. Her love will permeate every aspect of my blueprints for the future. I am a survivor, and I am no longer afraid.” I wrote these words in Survivorship is Not a Phase | Part 2 30 months ago. 30 months. My last blog post was July 31, 2017 in honor of Lori Marx-Rubiner, just a few days before her passing on August 2, 2017. I had noticed the news of hospice on her friend AnneMarie Ciccarela’s Facebook page. I was moved to write, “I Have Been Provoked | 7.31, 10.21, and MBC.” The rest of the amazing connections can be found there, as well as my sadness, and my tears. I am moved to write again today. As I look back across my various blogs, I realize this is the longest period I have been “quiet” since I started writing to the love of my life, Maureen, the summer before her passing on 10.21.2014. I started writing #lovenotes as her breast cancer “snuck out,” metastasized, that summer, because I did not want her CaringBridge page to be littered with news of disease and doctors but instead graced with love, my love, my love for her. As I am moved to write, though, I am also moved to ponder why I have been quiet. As I thought about my silence, I started to think about my own “survivorship,” something I wrote about in Part 1 and Part 2, in 2011 and 2015 respectively. Now, 30 months since Part 2, I’ve realized why I’ve been silent, but more about that and the reason for Part 3 in a moment. MBC – metastatic breast cancer – “takes” 40,000 women (and men) a year. That is a little over 130 a day. 130 beautiful people. 130 human beings that God put on earth to make a difference. 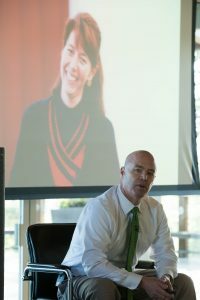 During the recent San Antonio Breast Cancer Symposium, I reconnected with, as well as met leaders in this space, like Katherine O’Brien and Shirley Mertz of the Metastatic Breast Cancer Network, and folks like Ginny Mason of the Inflammatory Breast Cancer Research Foundation, Bryon Davis of the Milburn Foundation, leaders like Dr. Susan Love, a breast cancer researcher and leader, as well as Chief Visionary Officer of her own foundation, dedicated people like Margaret Flowers and Marc Hurlbert of the Breast Cancer Research Foundation, and while at the Brinker Awards Reception for Susan G. Komen, I met folks like Barbara Segara, Edna Pacheco, and Anne Hamilton, passionate volunteers with Susan G. Komen. I also met someone else, and that story is when I started to understand a bit more about my silence. For this next meeting to make sense, I have to go back in time. Back in time with stops both 28 years ago and 4 years ago. 28 years ago, I was meeting Maureen for the first time at the Apple office in Chicago. We both worked there at the time. We “officially” started dating on New Year’s Eve of 1988. That was the day I picked her up from O’Hare. She had just flown back from Ridgewood, New Jersey, her family’s home at the time. I had already fallen in love with her months earlier. One glimpse at her in the office, and I knew. I knew we were destined to be husband and wife. At the same time as all of this was unfolding in Chicago, something else was unfolding. Research. Critical research into breast cancer and new pathways. HER2 to be specific. Dennis Slamon was “wandering” the halls of his offices at Genentech to ensure continued support for this research into HER2 and ultimately, the Herceptin that would create a new therapy for this kind of aggressive breast cancer. Until 4 years ago, I didn’t know this research was even happening. Fast forward 24 years…. 4 years ago. October 19, 2013. 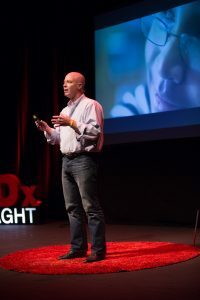 I was flying from the last of my TEDx talks in Dublin, Ireland, in tribute to my young hero, Kethan, who had passed that summer from the side effects of his treatments for leukemia. I was flying from Dublin to San Francisco to be with his mom and dad cheering on a friend, Jennifer Raymond, who was running the Nike Women’s Marathon with Team in Training in her own tribute to Kethan. It was a direct flight, and it took me over Chicago. Although there wasn’t any turbulence, I began to shudder. I was reading a chapter in the Emperor of All Maladies. It was the chapter about Dennis Slamon, HER2, and Herceptin. I was shuddering because I realized in that instant, reading that chapter from Siddhartha Mukherjee, the very drug that would extend Maureen’s life 20 years later when her breast cancer returned in early 2009 was being discovered. Fast forward to early December. This month. I wasn’t originally planning to stay two nights at the San Antonio Breast Cancer Symposium (SABCS), but I happened to run into Victoria Wolodzko, SVP of Research and Community Health Programs, and Paula Schneider, the new CEO of Susan G. Komen, walking from one meeting to another at the convention center hosting SABCS. They graciously invited me to the Brinker Awards Reception they were hosting that Wednesday night. And, as I sat with Edna, Barbara, and Anne, I realized why I was there. Two awards were given, and as I heard the name Dennis Slamon, it all came rushing over me… my love for Maureen… the chapter in Emperor… the flight from Dublin to San Francisco. The picture to the right is me telling this story to Dennis at the awards reception. Of it all coming full circle. Of how “his” Herceptin let Maureen have more years on this earth and how those “extra” years let her and my kids: Taylor, Kyla, and Katelyn, get to know their mom better. And, I also realized why I have been silent, and why this was my first SABCS to attend. Powerful words. And, 10.21 has loomed large this holiday season. 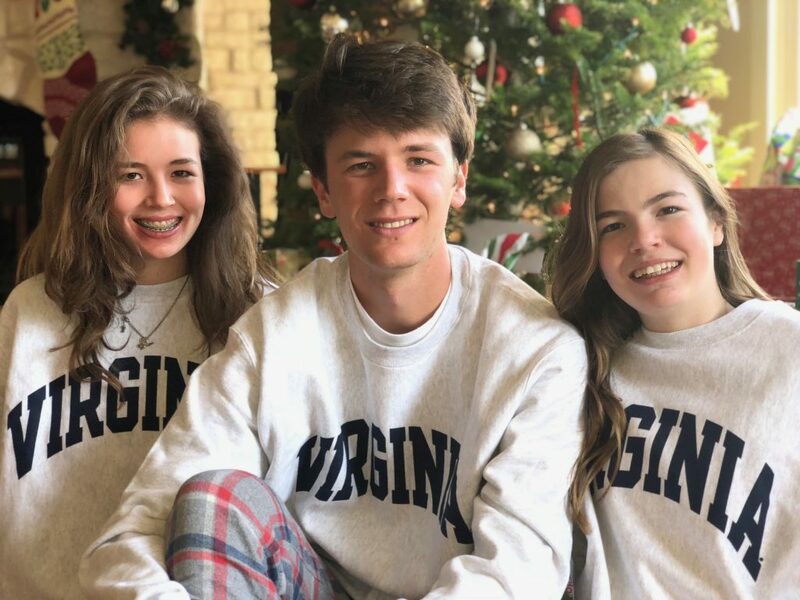 Taylor returned home from his first semester at the University of Virginia last Saturday night. I peeked at the clock on the stove as we walked into the house from the airport to pizza and hugs from his two sisters. 10:21. I also peeked at the clock on Christmas morning, as I sat down with my coffee, along with Taylor, Kyla, and Katelyn, to open gifts. 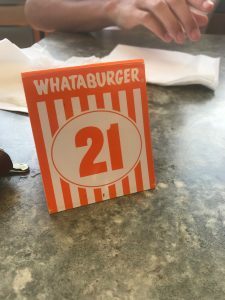 10:21. Survivorship is not a phase. The gift of SABCS has opened my heart to what is ahead in 2018 and how it is all connected. The holidays are always a rough and tumble of emotions. When a family is dealing with cancer, as ours did over Maureen’s 11 year on-and-off battle with breast cancer, it lurks in one way. Over the last 4 Christmases, we have gone from being numb during that first Christmas without Maureen in 2014, to reflective in 2015 and 2016, and as the kids and I noted this year, 2017, to being joyous. Don’t read that wrong. We’d do anything to have Maureen back with us physically. We miss her greatly, but as she reminded us through the many instances of 10.21, that it is OK. That she is “here” with us, and that more than anything, she wants her legacy of love to manifest itself in new ways, not just looking back, but forward. The kids and I felt that powerful, uplifting spirit throughout the day on Monday. This new spirit will not just move me forward but will be reflected as I write more stories about being both a caregiver and a widower. I will no longer be silent. 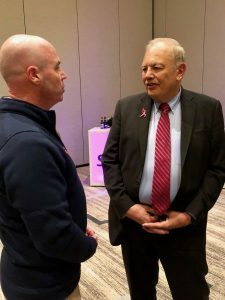 I have looked directly at my fear and pain, and as meeting Dennis Slamon reminded me earlier this month in San Antonio, it is all connected. Maureen taught us how to do more than “survive” over the course of her 11 year battle. Now, it’s our turn. 30 months after Part 2, We’re ready to starting writing the next chapter. We each have today, and today is a good day to be alive. And to love.